Your Grace is Sufficient: Don't expect to be paid back! Pay it Forward! Some of you may remember this inspirational movie that hit our silver screens over a decade ago. I believe you can catch the reruns on Astro. 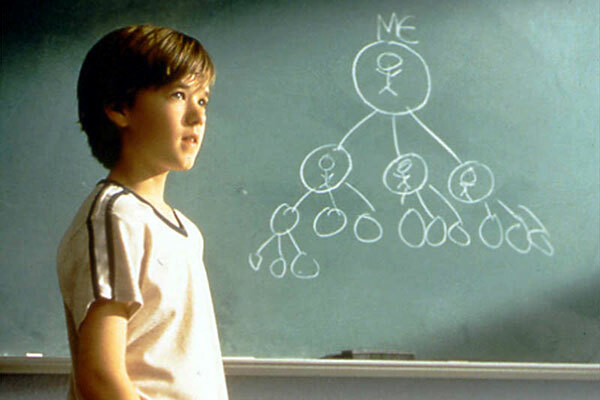 “Pay It Forward.” It is a movie about a seventh grader’s ingenious plan to make a difference in the world. On the first day of school, the protagonist and his classmates are challenged by their social studies teacher to change the world. Written on the blackboard; the challenge reads, “Think of an idea to change our world—and put it into action.” While most children disinterestedly slouch in their desks, this young man is mesmerised by the possibility of changing the world. Given the fact that his life was way down the garbage heap, living with an alcoholic mother, a grandmother who lives on the streets, an abusive and absent father, the prospect of just getting off the dump pile was most appealing. The setting for today’s gospel is that of a Sabbath meal. As usual, the movements and speech of Our Lord were constantly being observed by both his fans, as well as his detractors. But in today’s gospel, Our Lord would turn the tables on them. He is the one who is the careful observer. He makes a careful and poignant observation about the public behaviour of the Pharisees, who though wishing to be seen as self-effacing and altruistic, were actually quite ambitious and self-serving. After witnessing their jockeying around for the coveted seats, Our Lord began to teach. Jesus raises two important points, one for the guests and another for the host. Firstly, he warns the guests against an undue sense of superiority. Similar to our East Asian society, the Jewish culture was pretty much shame driven. On the one level, the suggestion of Jesus was a simple and universal advice on etiquette, never presume to take places of honour less you suffer the embarrassment of being relegated to a lower position. But here, Our Lord was not merely concerned with good manners nor should His sayings be reduced to advice about social graces. Rather, it is clear from the subsequent verses that Our Lord was trying to lift the attention of his audience from etiquette to eschatology; not just places at the dining table, but places in Heaven. More important than their social status in the eyes of others, was their good standing in the eyes of God. The key to truly gaining honour and earning the pleasure of God lies in humility. As the first reading reminds us, “the greater you are, the more you should behave humbly, and then you will find favour with the Lord, for great though the power of the Lord is, he accepts the homage of the humble.” The person who asserts his or her own importance has already been rewarded with the fleeting and dubious dignity that self-assertion brings. But a single moment of limelight may cost one to suffer a lifetime or even worse, an eternity of derision. Once again, the sin of presumption is their undoing. Again, Ecclesiasticus warns us, that “there is no cure for the proud man’s malady, since an evil growth has taken root in him.” The honest person, however, who recognises the greatness of God as well as his or her own lowliness and needs, will one day share the honour of union with the Lord at the heavenly banquet that never ends. After having admonished the guests, Our Lord turns his attention to the host. No one is spared, not even the good host who had just feted the Lord. Most likely, the Pharisee into whose home Jesus had been invited, had invited others like himself: friends, relatives and those with wealth who presence would reflect well on the host and his household. Nothing wrong with that. Moreover, all those invited would have been able, and indeed, would have been expected to reciprocate the favour by inviting the host to dine at their respective homes. In the light of this social give-and-take, Jesus’ advice must have seemed shocking and even ridiculous. To invite the beggars, the crippled, the blind and the lame would be to entertain those from whom one could expect no recompense or reciprocation. Such persons would not have brought prestige to the household by their presence. In fact, they would have brought shame to the host, who would be seen as associating himself with the dregs and outcasts of society. What is the common denominator that links both advices, the first to the guests and the second to the host? Both humility and giving should take the focus off ourselves. It’s not about us. The focus should always be on the Lord. Therefore, to take the lowest place is never just to earn honour, respect or even praise from others. To take the lowest place, would be, to find ourselves in that very place where Christ had chosen to sit, He who is God, assumed the lowest position of a worthless slave. To give without expecting anything in return would mean that we do not serve, or give, to derive some earthly gain and benefit from our investment, but rather, be assured that what often seems to be a thankless job will receive its reward from God in heaven. Indeed, this is the one single idea that can not only change the world, but also save it. The Kingdom of God does not follow the rules and logic of any culture. God’s ways cannot be understood in human terms. In the Kingdom which is one continuous wedding banquet, titles, positions and wealth do not count. What counts is fidelity to Jesus’ law of love that embraces even, and specially, the outcasts of society. They are the ones who will be exalted in the kingdom of God. Having nothing but their ability to trust in God, they will be rewarded in heaven, far above those who had position, honour and wealth in the earthly kingdom.